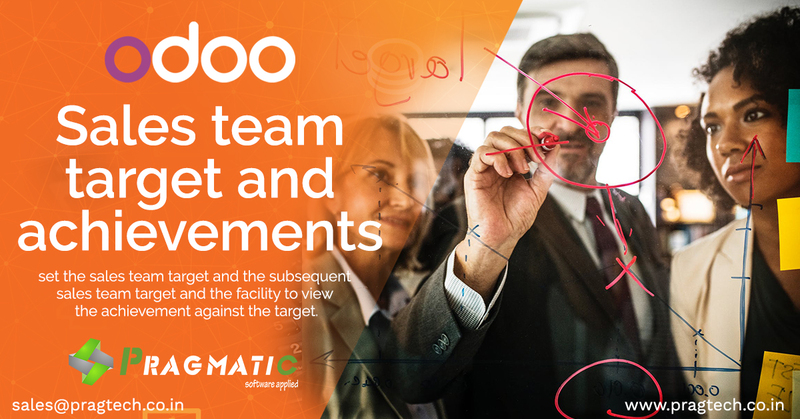 Pragmatic has developed a customized application in odoo to set the sales team target and the subsequent sales team target and the facility to view the achievement against the target. Current Odoo CRM system has facility to create the sales team but no provision to set monthly or yearly target to the sales executives. By considering this business needs, Pragmatic has developed a sales target solution in Odoo ERP, where manager can set the target for individual sales executive for a specific period like monthly, quarterly or yearly. Based on the individual target of the sales executives system will compute the team’s target and team wise achievement can be monitored. The functionality to set the sales team target can be customized as per client’s requirement to align with the business processes.